“All you thirsty ones, come to me! Come to me and drink! Every time I read the word “all” I get excited! Everyone who is thirst is welcome! Are you thirsty? How is your belly doing? How is my belly doing? Any sign of living water bursting forth? On the farm where I grew up the water source was a shallow spring fed well. The water naturally filtered its way through layers of sand before seeping into our well. Cool, tasteless and refreshing water! Ladies would come from miles around for this soft spring water to make their preserves. There was something about the water from this spring that seemed to sustain the flavours of pickles and preserves like no other water. The little spring consistently flowed and nourished five generations of thirsty ones. Even in years of drought the well gave forth its precious commodity of living water. Just a couple miles south, no underground springs could be found. The only water source in this area was open dugouts. They were stagnant pools open to pollution by animals and runoff. Algae grew unrestricted during the hot summer months. Our neighbours spent thousands of dollars in attempts to purify the stale water for usefulness. Winter and summer, they purchased and hauled suitable water for drinking. Though this water was fit for ducks and deer, it wasn’t safe for human consumption. The deepest wells in the district descending hundreds of feet below the earth’s surface, tapping into an underground lake. Here too, the water sat stagnant. Hidden from the sun but exposed to underground elements, this water was saturated with mineral content. Worse yet, the water smelled like rotten eggs! The water was extremely hard and corrosive. Even with expensive filtration equipment it was not suitable for drinking. Not all water is equal! The source here was abundant; the quality, however, was disappointing. Many years ago, my uncle searched for much needed water on his farm many miles away. To their great surprise, they accidentally struck a high pressure underground river. The “gusher” shot several feet into the air. Up from the hidden reserve flowed water crystal clear and sweet! Over the course of the summer an entire lake was formed where once there had been dry ground. When the pressure diminished, they were finally able to tap the well. Decades later this well continues to serve the farm’s needs. The peaceful lake still fills the gully below the well-head. It too is a source of pleasure and usefulness. I hope I haven’t wandered so far talking about natural water that we have forgotten the essence of what Jesus was offering. Whether we realize it or not, we are all thirsty; we quench this spiritual thirst in only One place. Money won’t do it! Fame or power won’t quench this thirst either. The wise respond to Christ’s open invitation to both come and drink – not just once, but continually! Those who know me well, know I’m usually within arm’s reach of a glass filled with water. I thirst a lot! They also know that I’m never far from catching a fresh “drink” of Holy Spirit! Yesterday’s encounter with Holy Spirit doesn’t carry through to today. Every morning I welcome Holy Spirit to infuse every part of my life. Only then will He “flow” in the river God intends. What comes out will be a reflection of what I welcome in! First Step: Come and drink! Third Step: A river flows! Is the river within me a quiet underground spring refreshing and useful to only a few? Worse yet, is it an open and stagnant pit – polluted and filled with spiritual algae? Is the internal reserve large, but without an outflow, “rotten” and hard? Or is it a “gusher”? 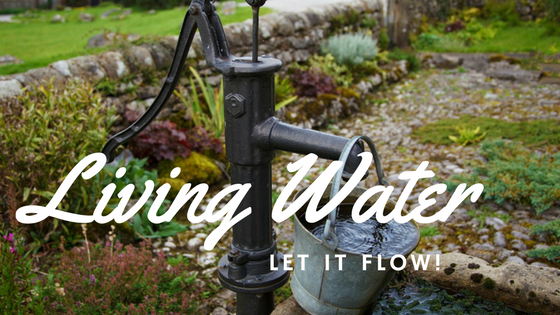 Is God’s reserve within me so full that it cannot be stopped, springing from Jesus Christ the true Source, with intense pressure that turns dry ground into a deep pool? If it isn’t, I’ve perhaps missed a step or two! Every time I come and drink from the Spirit, the pressure within is intended to build creating a supernatural force that flows from my life in a way that brings refreshing, healing, hope and strength to those around me. So my question is, “How is my belly doing?” Is there any evidence of living water flowing? JESUSssss!!! Rapids!!!!! White water rapids!!!! More Lord!!! Morerrrrrr!! JESUS!! !